Florida requires supervisors of food service establishments and non-retail food service establishments be certified in food protection. This means a person-in-charge, an owner, or manager of a food establishment – (i.e., restaurants, bars, cafes, bakeries, delis, mobile vending, food trucks, assisted-living, day care centers, and convenience stores) become certified by taking a approved food manager training course and successfully passing an accredited food manager certification exam. 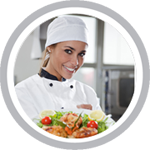 We offer online HACCP Training in Florida for: Jacksonville, Miami, Tampa, Orlando, St. Petersburg, Hialeah, Tallahassee, Fort Lauderdale, Port St. Lucie, Cape Coral, Pembroke Pines, Hollywood, Miramar, Gainesville, Coral Springs, Miami Gardens, Key Biscayne, Palm Beach, Niceville, Parkland, and many more!